Meenakshi Thirukalyanam or Meenatchi Thirukkalyanam is the divine marriage of Goddess Meenakshi and Lord Sundareswarar (Goddess Parvathi and Lord Shiva). Meenakshi Sundareshwarar Thirukalyanam is a major annual festival celebrated at the Madurai Meenakshi Sundareswarar Temple during the twelve days Chithirai Brahmotsavam Festival on the Tamil month of Chithirai (April – May). In 2012, the Arumigu Meenakshi Thirukkalyanam is celebrated on 2nd May 2012. Minakshi Thirukalyanam attracts thousands of devotees from all over Madurai, Tamil Nadu and near by states as well. Meenakshi Kalayanam is also a reunion of Shaivites (Lord Siva devotees) and Vaishnavites (Lord Vishnu devotees) reminding everyone that Lord Siva and Lord Vishnu are all the same - Brahman. 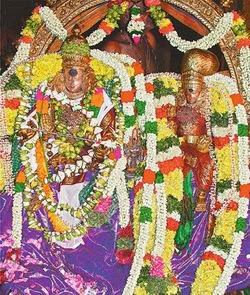 The next day of Meenakshi Thirukkalyanam is the Therottam or Car Festival and the Chithirai Festival concludes with Theerthavari or Theertha Festival on 3rd May 2012.